Voice and Data at the Same Time? Today I wanted to talk about using voice and cellular data at the same time. That is, being able to use you cellular data internet connection while you are on a phone call. I get a lot of questions from readers asking which cellular network is the best and which network should they use? I tell people to use the network that works best in their area. But, I often to forget to mention if you want to use both voice and data at the same time the AT&T network may be a better choice. Here’s why, when you use the Verizon network your data connection is disabled while your on a phone call but you can use data on the AT&T network. 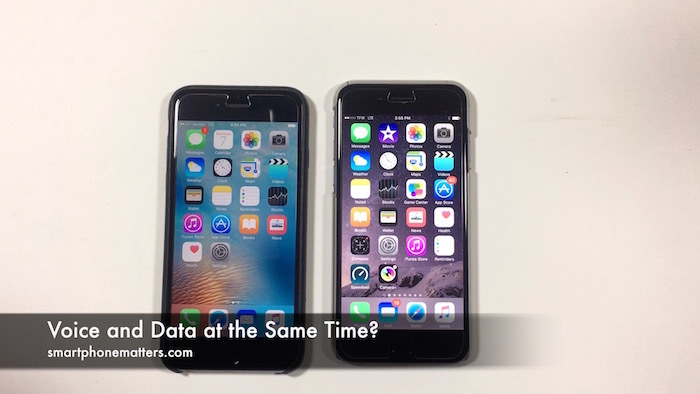 In the video, I demonstrate this using two iPhones, one using Verizon’s Prepaid network the other using Straight Talk’s AT&T network. You can see that I am able to browse the web on the phone using Straight Talk’s AT&T network but not the phone using Verizon’s prepaid network. This is a limitation of Verizon’s cellular technology, and the limit exists on carriers using Verizon’s prepaid network. To be fair, Verizon post paid customers now have access to advance features of the network such as Voice Over LTE or VoLTE. With VoLTE you voice call is handled as data and you can use your data connection at the same time. Unfortunately, Verizon has not made this feature available to prepaid customers. I am sure over time they will, just like LTE wasn’t offered to prepaid customers initially but eventually it was. It’s in Verizon’s interest to roll out these new features across their entire network because they are more efficient for the carrier. As I said, I often forget to mention this feature because I have been on the AT&T network so long. And, I do sometimes use my data connection to check email or look something up while I am on a phone call. What about you? Do you use voice and data at the same time? Leave a reply below and share.